In a highly competitive world, we like to stay ahead of the curve. We take great pride in the fact that we provide a healthier alternative to snacking. We don’t like to get complacent, so we always look for new ideas to dig into. We’ve had a bit of success with our range of Trinity Bars & we want to offer something our vegan & gluten intolerant followers can have but we don’t want to tamper with an already-saturated bar market. Enter the Super Slice – our new range of gluten-free, vegan slices. Now, you might be asking “Why not just perfect your range of Trinity Bars?” Well, first of all, there’s nothing wrong with that range & you shouldn’t try to fix something that isn’t broken, right? At the moment, a lot of companies are competing in the bar market. Instead of following the crowd, we’ve decided to go against the grain & offer something a bit different. What do you think of when you hear ‘slice’? Do you think of a sweet, naughty, but oh-so-tasty treat? We do. So why not offer a healthy slice option that everyone can enjoy without the added sugar or processed chemicals? Made with the same great ingredients that form the foundation for our Snackaballs & provide the product with a longer shelf life, the Super Slice is sure to disrupt the market & we can’t wait! You don’t need to worry about the Trinity Bar range disappearing from supermarket shelves overnight. We’ll keep our popular ones going & monitor progress, but there aren’t any promises that they’ll stick around forever. The Trinity Bar range has a small market & contains whey protein powder, which isn’t vegan-friendly. Not only that, but Agave is used in them, which doesn’t really fit with our healthy, clean, natural image. The Super Slice steps in to save the day with pea protein powder, a vegan alternative to whey & is sweetened with dates, not Agave. So who is the Super Slice for? The way we see it, the Super Slice is the perfect option for anyone who wants to mix it up a bit away from the Snackaballs. 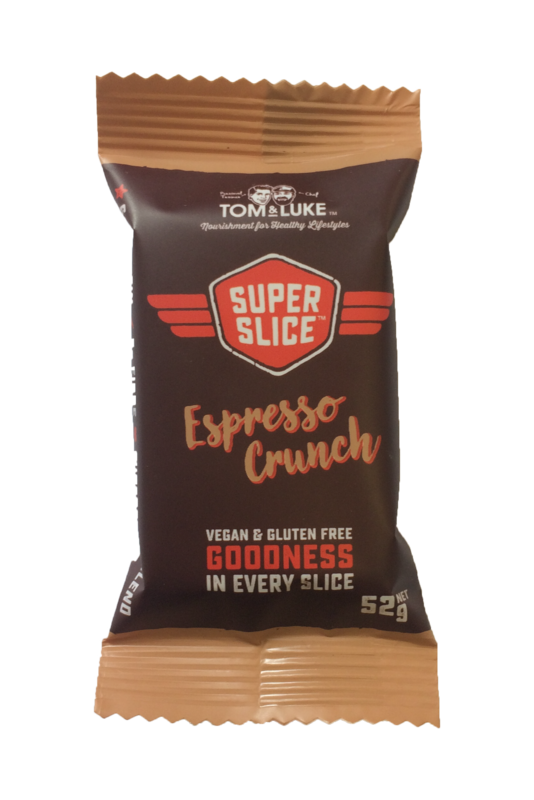 Whether you need fuel for your gym session, a post-workout snack or you want to chuck some dessert into your kids’ lunches, the Super Slice is for you! Not only will it keep you satiated between meals, it will also help keep your energy levels up for longer. Our ultimate goal is to rid the world of rubbish – whether that’s unhealthy food, actual rubbish, dirty politics, you name it, we want to make the world a better place to live. Our first steps were the Trinity Bars & the Snackaballs. Now we’re onto the Super Slice with its recyclable & biodegradable packaging. We’re not perfect & we know we have a long way to go before we can be truly sustainable, but we think we’ve gone a big leap in the right direction & we’re glad you’re along for the ride!